Crochet garlands - they are strings of colourful happiness! Come along to the Bellberry class and learn to make your own bright and cheerful bell flower garland. Use the flowers or garlands as room/party decorations, gifts, jewellery, key ring fobs, Christmas tree decorations... anywhere needing a burst of happy colour! In this class we'll learn how to work the bell flower, berry and leaves, step by step. Colourful Rico Essentials cotton will be available to use and take home with you to finish your garland. To make the most of this class why not have a little practice before the day? A great place to brush up on the basics is over on the Moogly blog. What you'll need to bring: the pattern and some yummy treats for afternoon tea will be provided, so you'll only need to bring along yourself and your 3.5mm hook. Classes are $45 per person & spaces are limited. This workshop is held at Lopdell House, Titirangi, Auckland. For more info, or to book your place please message me here. Embossed crochet - it's one of the cool new crochet techniques around at the moment and is easier to do than you might think! In this class we'll learn how to work the Pacific Petals square, step by step. This textured square can be made with a range of yarn weights, depending on your project. So you can choose something to suit from your stash, or opt for the 'yarn provided' choice for the class. The pattern calls for sport weight yarn but DK yarn would also make a nice thick & chunky square. The main stitches used in this pattern are front and back post stitches. Don't worry if you haven't used these before, with a little tuition they are easy to get the hang of. To make the most of this class why not have a little practice before the day? A great place to brush up on the basics is over on the Moogly blog. What you'll need to bring: the pattern and some yummy treats for afternoon tea will be provided, so you'll only need to bring along your hook and yarn (3.5mm hook with sport weight yarn, or 4mm hook with DK yarn). The provided yarn will be DK weight, so if you choose this option you'll need to bring a 4mm hook. The Embossed Crochet class is $40 per person (BYO yarn) or $45 (yarn provided) & spaces are limited. 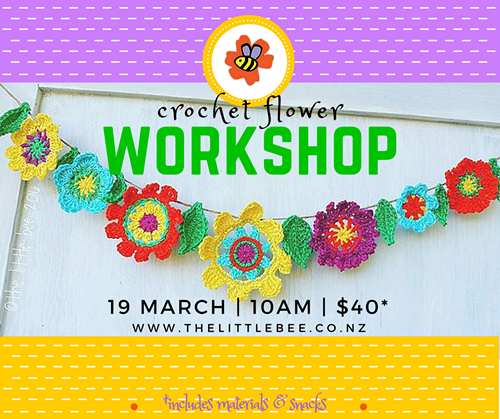 This workshop will be held at the Norfolk St Workshop in Grey Lynn, Auckland. 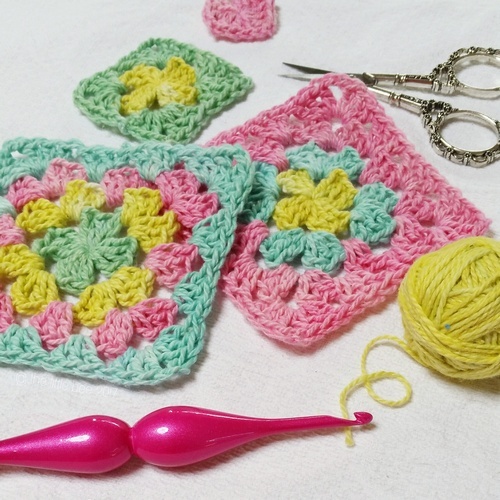 In this class we'll learn how to work a standard square using the basic crochet stitches and techniques (starting, changing colours, fastening off & joining squares). Basic skills will come in handy for this class, but there is also room for some beginners too (just let me know when you book). To make the most of this class why not have a little practice before the day? A great place to brush up on the basics is over on the Moogly blog. All materials will be provided including a range of coloured yarn, pattern, and a hook for you to take home. There will also be some yummy treats for afternoon tea! 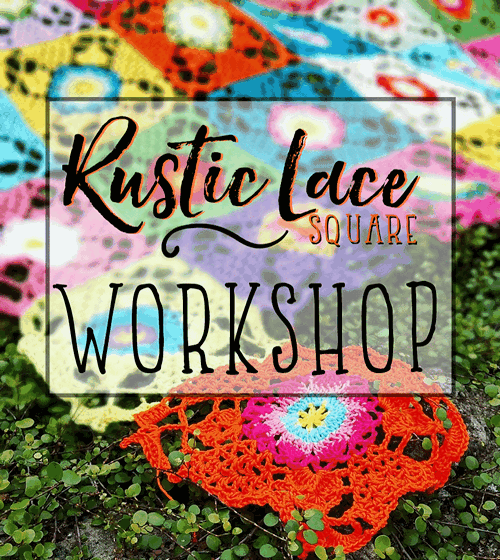 Granny square classes are $45 per person & spaces are limited. 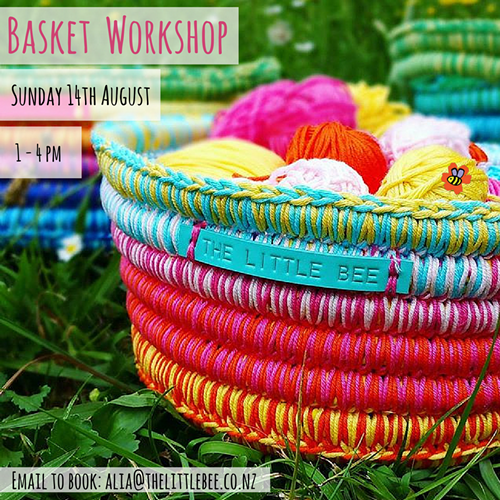 Workshops are held at the Norfolk St Workshop in Grey Lynn, Auckland. 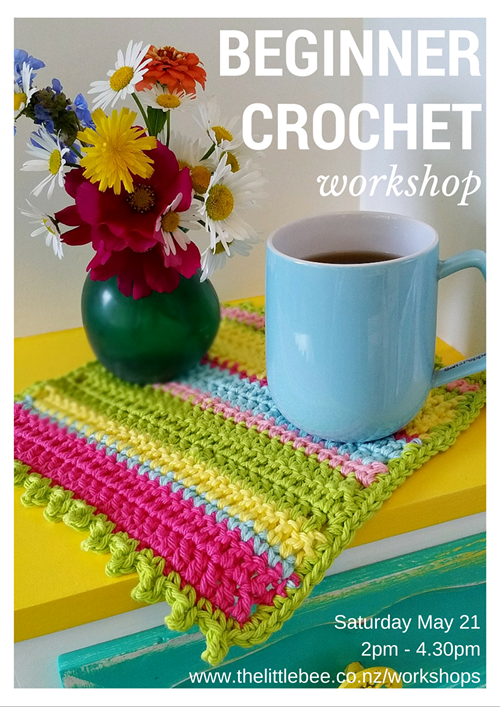 Re-purpose those old fabric scraps into a fabulous crochet rag rug in this fun workshop. 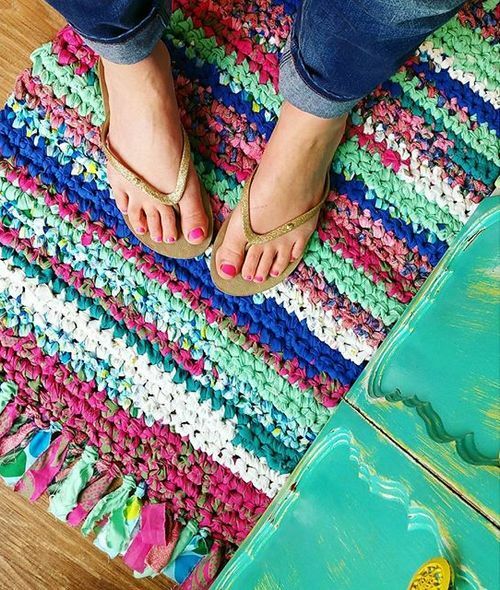 In this class you'll learn tips on creating and joining the fabric strips and a crochet method for constructing your rag rug. Be prepared to roll up your sleeves & have fun with scissors and hooks! A large hook (for you to keep), the pattern and some fabric will be provided & if you have a particular colour combination in mind it might pay to hit the op shops before the class. Look out for old sheets, duvet covers & fabric scraps. Choose light weight cotton fabrics - the larger the better! Clothing can be used as well, though it will be more fiddly to turn into strips. As usual there'll be tea/coffee and something yummy to eat as well. In this class you'll learn to crochet your very own crochet basket. 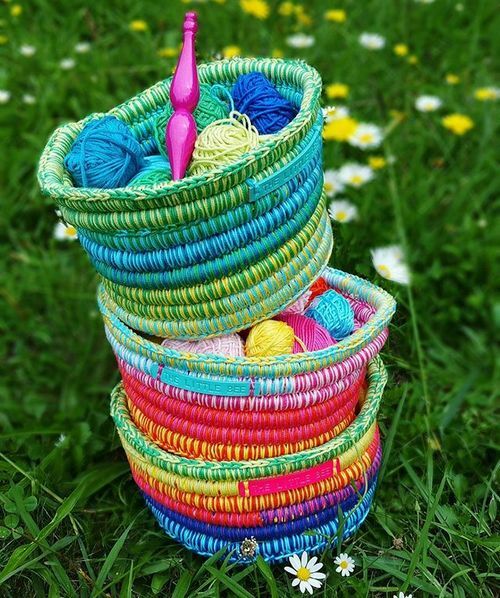 Using rope, these baskets are sturdy, yet soft and great for storing all sorts of things! Quality Rico Essentials cottons will be used to make the baskets & a range of bright colours will be available for you to choose from. Basic crochet skills are required ~ a great place to brush up on the basics is over on the Moogly blog (the Magic circle, sc, hdc and crocheting in the back loop (BLO) are good to know for this class). All you need to bring is yourself and a 5mm hook ~ the pattern and all other materials are provided and there will be tea/coffee & something yummy to eat as well! Come along and kick off the new year with a bang at this special Summer School session at the Norfolk Street Workshop. 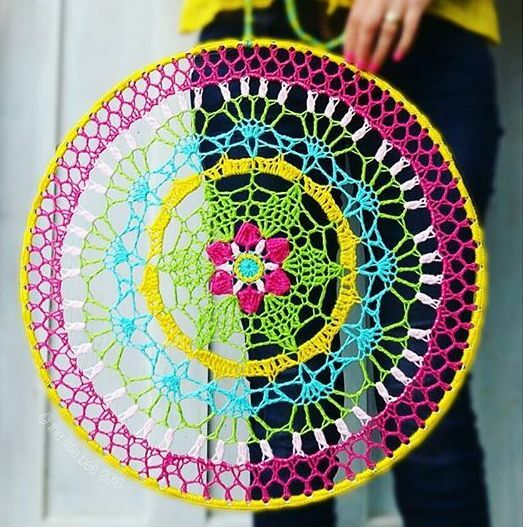 In this longer 6 hour class we'll be taking inspiration from the lovely Lucy of Attic24 to create our own magnificent hoop mandalas. 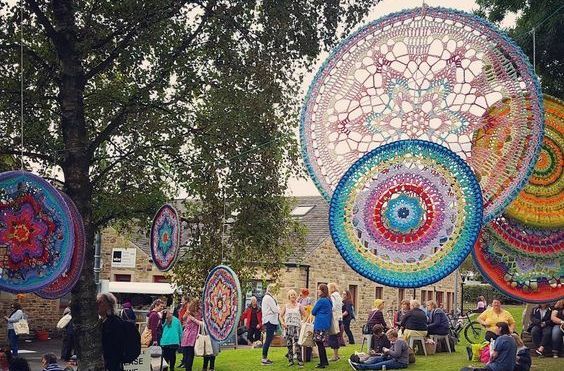 Featured as part of the display at this year's Yarndale in the UK, Lucy and friends contributed a collection of hoop mandalas that looked amazing as they hung in the trees. These mandala look fabulous displayed indoors or out. Choose to make a statement by hanging your mandala on a wall at your place, or add colour and movement to your garden by suspending it from a tree outside. All materials will be provided including a large range of coloured acrylic yarn (it lasts the best outdoors without rotting or fading), a steel hoop, patterns, and some yummy treats for morning & afternoon tea! Basic crochet skills are required to be able to make the most of this class ~ a great place to brush up on the basics is over on the Moogly blog. Mandala patterns will be available to suit a range of abilities, from people new to crochet as well as a few more challenging designs for those wanting to learn some new techniques. All you need to bring is yourself, some lunch, and a 5mm hook. Summer School classes are $90 per person & spaces are limited. In the last of my workshops for 2016 we'll be focusing on creating crochet flowers and leaves - my favourite! These goodies are brilliant for stringing together on garlands, making a floral headdress, adding colourful decoration to bags (pictured) and baskets, hair ties or brooches, shoes... the options are endless! Quality Rico Essentials cottons will be used to make the floral creations & a range of bright colours will be available for you to choose from. Basic crochet skills are required ~ a great place to brush up on the basics is over on the Moogly blog (the Magic circle is a good one to know for this class). Patterns will be available to suit people new to crochet as well as a few more challenging designs for those wanting to learn some new techniques. All you need to bring is yourself and a 3.5mm hook ~ all other materials & patterns are provided and there will be tea/coffee & something yummy to eat as well! ** Due to popular demand a second class has been scheduled for Sunday 30th October, 1-4pm. Be quick to secure your spot - only a few places remain! All you need to bring is yourself and a 4.5 or 5mm hook ~ the pattern and all other materials are provided and there will be tea/coffee & something yummy to eat as well! Classes are $40 per person & spaces are limited. 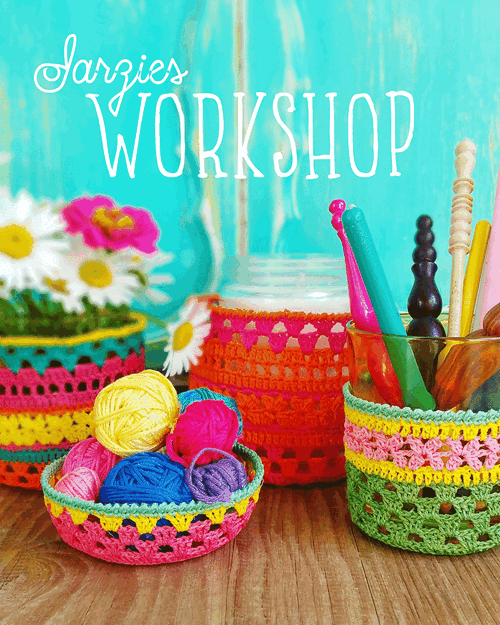 In this class you'll learn to crochet your very own Jarzie cover for a wee glass milk bottle. Quality Rico Essentials Crochet cottons will be used to make the jar cozies & a range of bright colours will be available for you to choose from. 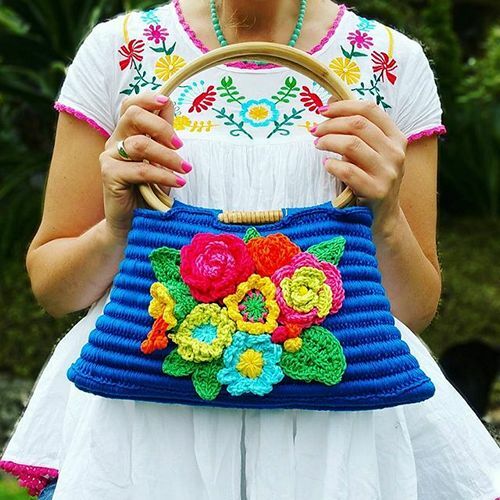 Basic crochet skills are required ~ a great place to brush up on the basics is over on the Moogly blog (the Magic circle, sc, dc, clusters and crocheting in the back loop (BLO) are good to know for this class). 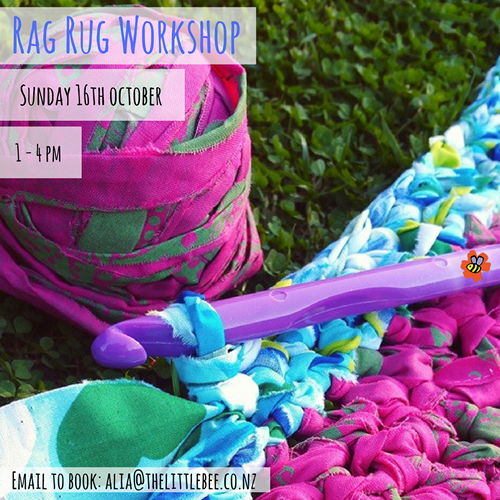 All you need to bring is yourself and a 1.5mm crochet hook ~ the pattern & other materials are provided and there will be tea/coffee & something yummy to eat as well! Join me at the Norfolk Street Workshop on June the 11th to learn how to make these beauties ~ we'll cover all the basics as well as the joining technique. Quality Rico Essentials cottons will be used to make the squares & a range of bright colours will be available for you to choose from. Basic crochet skills are required ~ a great place to brush up on the basics is over on the Moogly blog (the Magic circle, dc & tr are good to know for this class). This class focuses on learning some basic crochet techniques and applies these new skills to create a funky dishcloth in chunky bright kitchen cotton. To get a head start on what the basic stitches look like you might like to check out the video/photo tutorials over on the Moogly blog. 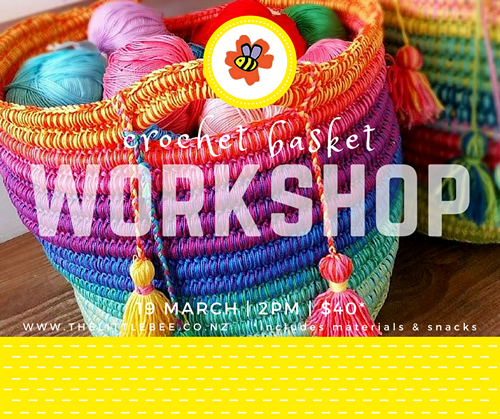 All you need to bring is yourself and a 5mm crochet hook ~ the pattern & other materials are provided and there will be tea/coffee & something yummy to eat as well! 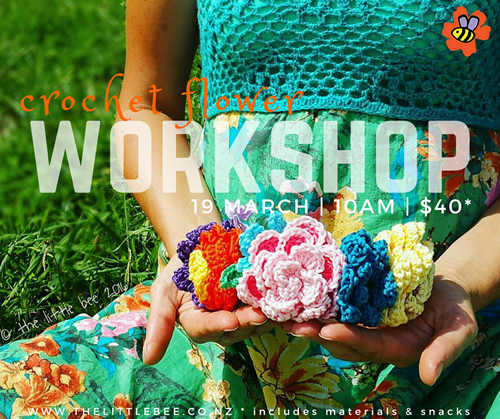 In this class you'll learn to crochet a range of different flower designs (and some leaves too). Depending on your quirk-factor you can choose to make either a 3D Frida Kahlo inspired 'crown' or a vibrant cotton & twine garland! Basic crochet skills are required ~ a great place to brush up on the basics is over on the Moogly blog (the Magic circle is a good one to know for this class). All you need to bring is yourself and a 3.5 or 4mm hook ~ all other materials & patterns are provided and there will be tea/coffee & something yummy to eat as well!